In 2006, a calico cat named Willow escaped from her home in Colorado when a contractor left a door open. 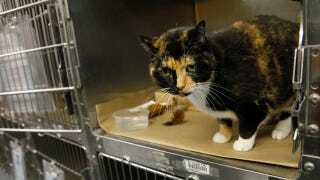 Yesterday a man found her in New York City and took her to a shelter, where she was identified thanks to a microchip. Her owners Jamie and Chris Squires say they were "shocked and astounded" when they got a call that their cat had been found. "To be honest, there are tons of coyotes around here, and owls," said Jamie. "She was just a little thing, five and a half pounds. We put out the 'Lost Cat' posters and the Craigslist thing, but we actually thought she'd been eaten by coyotes." The Squireses are working with the shelter to arrange transportation for Willow and she should be back home within two weeks. Only the couple's 17-year-old and 10-year-old remember Willow, but their 3-year-old saw a picture and deemed her a "pretty cat." Willow is healthy and probably didn't spend the last five years on the streets, but we'll never hear about all the mice she chased or learn whose shoes she left her hairballs in.